Performance Woman on a Cross (2014). Jill McDermid, Woman on a Cross. Venice International Performance Art Week (2014). Photograph by Monika Sobczak. Lives and works in Brooklyn, NY and Kingston, NY. Jill McDermid is a multimedia artist and curator working in performance, sound, video and installation. Her works are autobiographical, using elements of where she is or components of her life as inspiration for work, with the belief that the personal is also political. During the early 2000s she created a series of works entitled American Woman Parts 1-8, exploring the American psyche, from a woman’s perspective, while traveling to various countries and encountering varying perspectives on American foreign policies. Her recent work is taking on a wider perspective related to our relationship with Nature, exploring the resurgence of civilizations, their varying knowledge and their effects upon the earth. McDermid is Director and Curator of the Grace Exhibition Space for International Performance Art in Brooklyn. 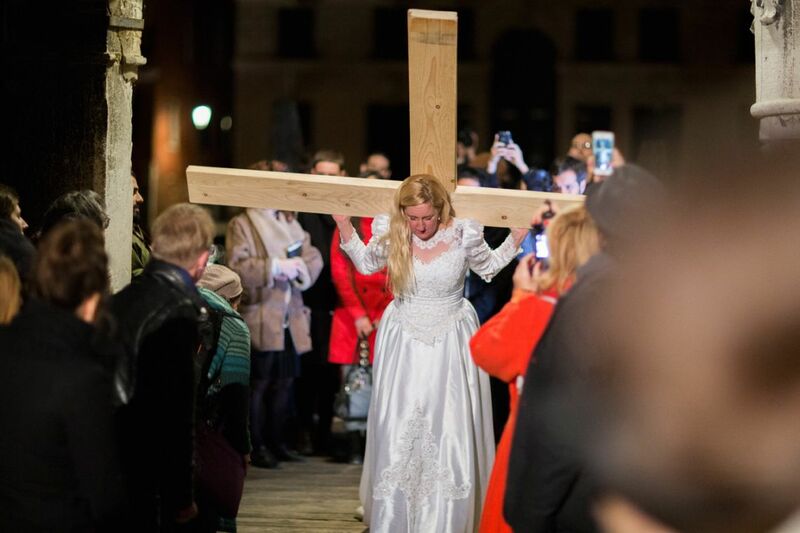 At the VENICE INTERNATIONAL PERFORMANCE ART WEEK 2014, McDermid presents Woman on a Cross, a performance art piece that asks the question: would a female savior have been more threatening than the male savior? Presented by Grace Exhibition Space.